Reader Nancy Harkrider, who’s spent many years living in Asia, must have taken one look at this photo on the blog earlier this week. . . Indeed it would Nancy, and thanks for suggesting it. 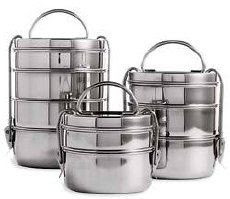 I’ve long thought about purchasing a tiffin set (in fact, I was eyeing one recently at Uwajimaya), and you’ve convinced me that now’s the time. By the way: I’ll bet you’d appreciate this incredible tale of the “tiffin-wallahs” of Bombay — a story I first read a decade ago and still find fascinating today.